See the new, remodeled Virginia Historical Society! Richmond is full of hidden gems for the traveler--Maymont, the Edgar Allen Poe Museum, and the Museum of the Confederacy, to name a few. But one of the most often-overlooked is the Virginia Historical Society. That’s a shame, because this free museum is chock-full of historic artifacts, interactive exhibits, and arcane items to please all ages. In fact, the museum says it offers "16,000 years of history in two hours." Located next door to the Virginia Museum of Fine Arts, and newly remodeled, the Society is like a huge family scrapbook for the state of Virginia. Filled with room after room of artifacts ranging from the quirky to sublime, the Society has something to interest every age. 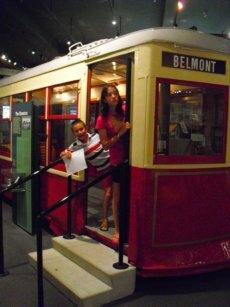 There are rooms where you can try on Colonial or Civil War bonnets, caps, and other garb, heft Civil War- era rifles to your shoulders and take “aim,” sit in an electric streetcar, peer into a doll house version of Richmond’s Georgian mansion, Wilton House, see a Wurlitzer jukebox, and more. Near the Boulevard entrance of the Virginia Historical Society is an authentic log cabin where you can view short videos about Virginia history. Younger kids may not find them interesting, but never fear: Immediately outside the cabin’s windows are computers where kids can play the “Little Virginia” game. 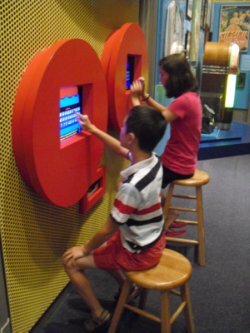 Kids use the interactive computer to answer questions on Virginia history, then print out a colorful diploma to show their progress. 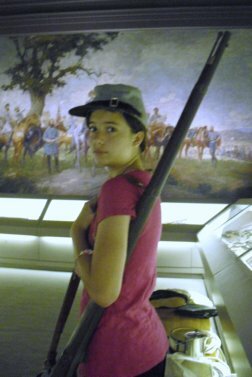 You get to learn about Virginia history and so do your kids--just in different ways. - The Private Jefferson - includes Jefferson's copy of the Declaration of Independence, plus 60+ letters and architectural drawings. - Toys of the 50's, 60's, and 70's - Everything from Gumby to Slinkies. - Firearms in Virginia - a comprehensive exhibit of the history of firearms in the state. The Society also has a top-notch research library where you can request to view a variety of items, including rare Confederate money and military manuals. They even have a database of Virginia slave names based on original documents which you can go through. Their Education Department offers SOL-related field trips, teachers institutes and summer camps for kids. They also offer Girl Scout programs and teas at nearby Virginia House, a former British manor house which was demolished, shipped, and rebuilt in Richmond during the 1920’s. For a full day of history and culture, visit the Virginia Historical Society in the morning, then walk next door to the Virginia Museum of Fine Arts for lunch in their café, followed by a tour of their world-class collection. Visit on a Thursday, and you can make an evening of it, with the art museum’s “Jazz Café,” a free event every Thursday from 6-9 pm featuring the Richmond Jazz Society. Looking for more things to do in Richmond? Be sure to see historic Maymont, and the often-overlooked Museum of the Confederacy. Or go to my Richmond Attractions page. Looking for more things to do in Virginia? Go to our Virginia Attractions Page.